Will Robots Fuel the Next Wave of U.S. Job Growth? The theory is often heard: "We're all going to lose our jobs to robots." However, the Association for Advancing Automation (A3) is pushing back. They say the effects of automation are widely misunderstood, and that the correlation between robotics implementation and employment growth is clear. 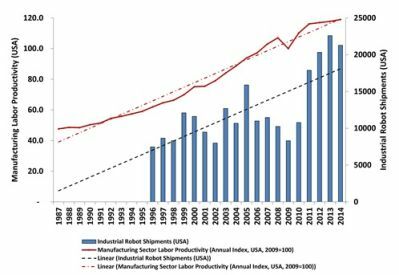 A3 contends that today's robotics offer U.S. manufacturers improvements in efficiency that are driving up profits and employment. According to the National Association of Manufacturers, the manufacturing industry supports an estimated 17.6 million jobs in the United States -- about one in six private-sector jobs -- with more than 12 million Americans (or 9 percent of the workforce) directly employed in manufacturing. Interestingly, increases in robotics shipments map closely to increases in U.S. employment. Figure 1 plots U.S. employment (in thousands) versus robot units shipped in the United States since 1996. 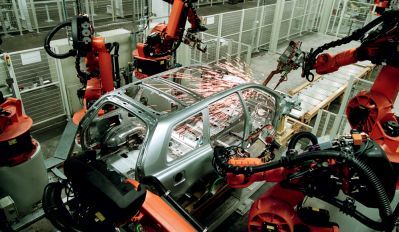 From 1996 to 2000, before the recession in 2001, American employment increased while the number of robots being installed grew. Since 2010, the U.S. robotics industry has grown substantially, setting new records for shipments. 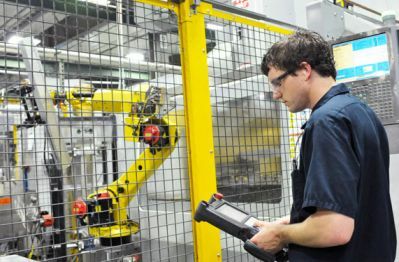 During this period of booming robot sales, U.S. employment continues to increase, indicating that the use of robots parallels overall improvements in employment. 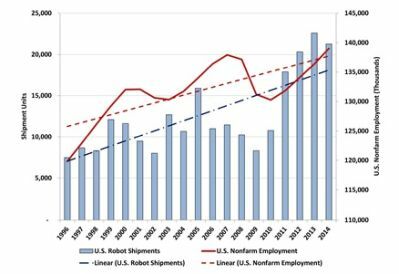 Growth in robotic shipments also parallels improvements in labor productivity, as shown in Figure 2. There are three important trends that must be examined to clarify how robotics is shaping the U.S. manufacturing industry: the reversal of offshoring, the use of automation for repetitive and dangerous tasks, and the domestic shift to a service economy. The industry also has an opportunity to impact future growth through new education initiatives. Until recently, the trend has been for companies to outsource manufacturing operations to emerging markets in order to take advantage of dramatically lower labor costs. The U.S. Department of Commerce reports that in the 2000's, brand-name U.S. multinational corporations -- which employ one-fifth of all American workers -- cut their domestic workforces by 2.9 million while increasing their overseas employment by 2.4 million. "Manufacturing employment collapsed from a high of 19.5 million workers in June 1979 to 11.5 million workers in December 2009, a drop of 8 million workers over 30 years. Between August 2000 and February 2004, manufacturing jobs were lost for a stunning 43 consecutive months -- the longest such stretch since the Great Depression. Manufacturing plants have also declined sharply in the last decade, shrinking by more than 51,000 plants, or 12.5 percent, between 1998 and 2008." As low labor rates tempted U.S. companies to take their manufacturing operations overseas, U.S. manufacturing jobs steadily declined. However, the trend of outsourcing manufacturing operations offshore is beginning to shift. With rapidly rising labor costs in countries such as China, manufacturers are seeing erosion in the cost advantages of manufacturing outside the U.S. The majority of the careers that the skilled labor force has been seeking in recent years are service-related. Manufacturing is no longer one of the nation's most coveted career paths. Harold L. Sirkin, Boston Consulting Group, expects the new trend to continue. "Over the past couple of years, we've projected an improvement in U.S. manufacturing competitiveness by 2015 that would help drive an American manufacturing revival; the results of our latest survey make clear that a profound shift in attitude is beginning." Automation using robotics is helping this attitude shift by allowing domestic companies to remain cost-competitive while keeping their manufacturing operations in the U.S.
Drew Greenblatt, CEO and owner of Marlin Steel, has been outspoken about the positive impact of robotic automation on his business and his employees, stating on a company blog post: "Not only has changing over to an automated production process saved our company from the threat of bankruptcy, saving the jobs of everyone here, it has allowed us to expand our work force. Since going automated, Marlin Steel has nearly doubled the size of the work force, adding engineers and automated production specialists to our existing team." He goes on to describe how these new jobs better position his employees for the future with a higher quality of work and better compensation. There are many other examples, in companies of all sizes, where automation is helping the U.S. keep and create new manufacturing jobs. Geoff Escalette, CEO of faucet-maker RSS Manufacturing & Phylrich in Costa Mesa, CA, stated that, "The whole premise for our company is to bring manufacturing back to this country. Our new robot fits perfectly within that master plan." Americans Are More Educated than Ever Before -- But Is It the Right Education? While the change in overseas labor is a factor, an equally powerful shift is happening in the U.S. The current drive for higher education is producing a wave of employees who want rewarding, career-oriented jobs rather than the entry-level, manual positions that were historically available in the manufacturing sector. Of note, however, is that most of the jobs being created for this educated workforce are not in manufacturing. Instead, they are service-related jobs. Figure 3 shows U.S. private-sector employment from 1996 to 2013 and illustrates how jobs in service industries have steadily grown in the United States (controlling for recessions). Over this time period, the service sector added 18.9 million jobs, while the goods-producing sector contracted by 4.7 million. This resulted in a positive net effect of adding over four times more service jobs (in fields such as retail, transportation, information, financial activities, insurance, accounting, real estate, management services, healthcare, leisure, professional services, and education) than the number of goods-producing jobs lost. The majority of the careers that the skilled labor force has been seeking in recent years are service-related, which suggests a harsh reality: Manufacturing is no longer one of the nation's most coveted career paths for those entering the workforce. But what about students in science, technology, engineering, and math (STEM) fields who are still looking for careers in manufacturing? In 2014, Universum, a global research and advisory firm, asked nearly 8,000 undergraduate engineering students to identify from a pool of 230 companies the employers for which they most wanted to work. Additionally, the students were asked about their career goals and what aspects of a job are most important to them. The results indicated that while engineers want to be paid competitively, they evaluate jobs along a host of other metrics as well, including job security, a creative and dynamic work environment, and opportunities for professional development, innovation, challenges, and strong leadership. Kevin Troy, head of research at Universum, reports, "Students aren't in this kind of fearful attitude about needing to find something that pays well and will continue to employ them for several years after they graduate; they're beginning to take other things into consideration as well." As the United States shifts to a service economy, U.S. robotics manufacturers themselves are facing increasing demands for educated, enthusiastic people to service and install their robots. One result of the shrinking pool of unskilled labor in the U.S. is that manufacturers are able to automate repetitive, dull, dangerous, and low-wage jobs and shift technical workers into more appealing, career-oriented positions. Tegra Medical, a medical device manufacturer in Franklin, MA, doubled its manufacturing throughput and freed 11 full-time manufacturing positions when the company implemented robotics. Tegra was able to repurpose all of these operators into other processes and operations to keep up with company growth. Hal Blenkhorn, Tegra Medical's director of engineering says, "When we see an operator that does nothing but load a part every 10 or 20 seconds, we try to put more value-add to them by training them in new skills, whether it's a different operation or by having them become the robot supervisor in that area." Interestingly, one of the benefits of automation is the ability to draw a new level of employee -- people who are excited about learning to use robots. "We're now able to attract people who aren't just looking to draw a paycheck, they're looking for a career," says Matt Tyler, president and CEO of Vickers Engineering, a contract precision engineering manufacturer in Michigan. Jordan Klint, senior automation engineer, adds, "In order to bring young people into the business, you have to have technology. The guys who report to me really enjoy the robotics side. They think robots are cool." "Automation will also produce some new jobs in firms that sell the new 'robots' or other labor-saving technology. This means that, in general, there will be an overall shift in the economy in the direction of higher-skill and higher-wage jobs. Moreover, if the United States becomes a leader in producing productivity-enhancing technology, it will experience a growth in jobs serving foreign markets." A critical variable is providing the right technical education for prospective employees in order to meet demand. Manufacturers currently have high-paying, professional jobs available, but can't find enough qualified applicants to fill them. According to a skills-gap report by Deloitte, manufacturers will need to fill 3.4 million jobs over the next decade, with only 1. 4 million qualified workers available. Educational efforts such as robotic internships, co-ops, and competitions can help dispel misconceptions about manufacturing careers. In response, automation professionals are stepping up to find ways to bridge the skills gap, recruit employees, and prepare the future workforce. That includes providing access to hands-on training, educational tools, and early-education STEM programs that will help build needed technical talent. Growing the educational curriculum for robotics -- in prep schools, technical programs, and community colleges -- will help populate the manufacturing sector with a new generation of technically trained employees. Educational efforts and joint industry-academia programs such as robotic internships, co-ops, and competitions can also help dispel misconceptions about manufacturing careers, and can be targeted to underrepresented groups in manufacturing such as women and minorities. Today's U.S. workers want jobs that are more interesting and safe and that offer opportunities for advancement. Those desires often mirror by employers' concerns. Tedious, manual jobs tend to have high turnover, which drives up costs for recruiting and training, while workers who stay in those positions can drag down productivity with low morale. Repetitive operations can make it difficult for human workers to maintain consistent output quality, and the use of potentially dangerous equipment can lead to on-the-job injuries. Robots are the ideal replacement for these repetitive, low-wage positions, and allow companies to move employees into more appealing, career-oriented positions. Importantly, robots can also improve employee safety. Repetitive operations can make it difficult for human workers to maintain consistent output quality. Canadian shelving system manufacturer Etalex uses a collaborative robotic arm to manually unload a brake press -- a physically demanding and dangerous job that required eight hours of manual labor a day. "Before, you had to put your hands close to the brake press," said machine operator Richard Clive. "There was always a chance of an accident happening at any time. But now, there's no chance of anyone getting injured." 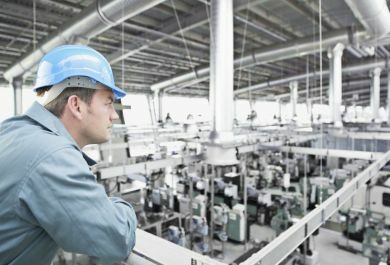 U.S. manufacturing is a complex industry that is shaped by outsourcing, the shifting desires of our increasingly educated workforce, and the demands for manufacturers to be more competitive in today's worldwide markets. One element that impacts all of these variables is automation, which will be key to manufacturing's revival in the United States. Robotics is a growing, exciting field, and with the right curriculum infrastructure, it can help create a new, highly productive and profitable generation of manufacturing employees. "We have a buzz phrase: exploit technology not people. Low-cost labor exploits people. An efficient manufacturer exploits technology, and that's what we do."